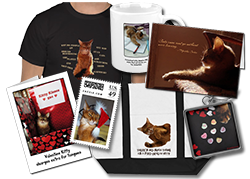 You are here: Home / Book Reviews / Giveaway – The Best Cat Book Ever! 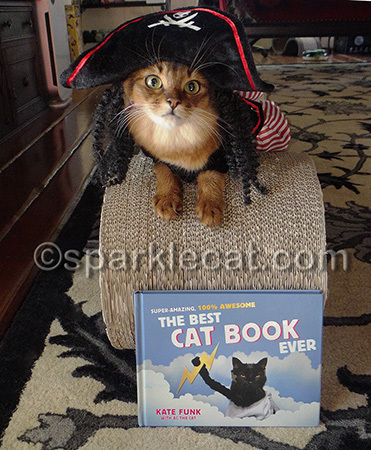 Giveaway – The Best Cat Book Ever! 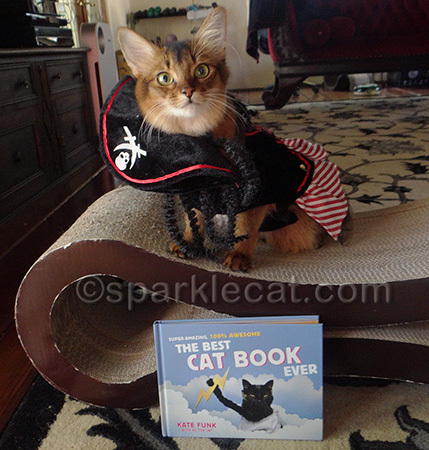 I guess you have seen some other cat bloggers talking about this book, The Best Cat Book Ever. 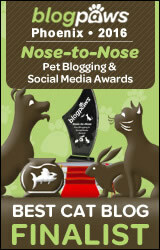 But I bet you have not seen a cat blogger get dressed up to do it! Except now you have. Honestly, I don’t know if this is the best cat book ever (personally, I think that might be one of Sparkle’s two books), but it is really fun! This human, Kate Funk, always wanted a kitty and eventually she wound up with AC, a handsome black cat with lots of attitude. And through a strange turn of events, she found out that he would wear outfits. So she spent loads of time creating elaborate (and sometimes not so elaborate) dioramas and costumes for him. And I thought my human was a little bit strange. Here is AC as a Mexican wrestler. Could it be? AC as Medusa? Wow! AC is a bunch of different characters in the book — a princess, an indian, Gozilla, Count Catula, a lumberjack, Santa’s Elf and lots more! He and his human are really creative and this is a very cute book! Sorry about the wardrobe malfunction, but I got really excited because I am doing something different for this giveaway! Yes, I have five copies to give away to anyone anywhere in the world and 50 cool postcard packs of AC, but with a twist. The marketing humans for St. Martin’s Press will be sending out the postcard packs and four of the books, but I had them send me one of the giveaway copies. So one winner will not only get the book, but also a little gift I will pick out and send along with it! If you want a chance to win one of the books, enter using the Rafflecopter widget below. For the postcards, I will just pick names randomly from the comments. Good luck! Disclosure: I received a free copy of this book for review. Link to Amazon is an affiliate link, so I can hopefully make up the postage it will cost to send off my special copy of the book! We missed the deadline for the contest but you do look Maaarvelous in your outfit! Summer, you are just too cute in that pirate hat. Love it! Summer you are such an emotive kitty! Summerâ€”you are so adorable! Thanks for giving away such a great book! Summer, this book looks like so much fun and i love your pirate hat. 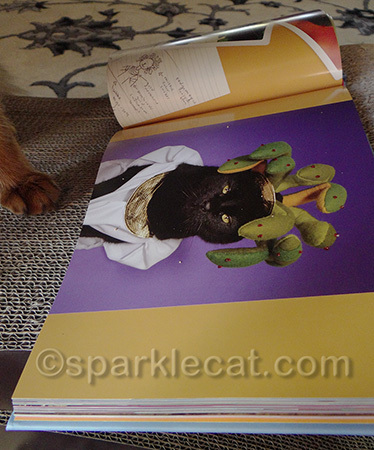 I’m also surprised that Binga did not photobomb your photo session. This would be so much fun to win. Summer, you have a great temperament, you’ll be a wonderful therapy cat! This looks really cute! I wish my kitties would wear adorable outfits! 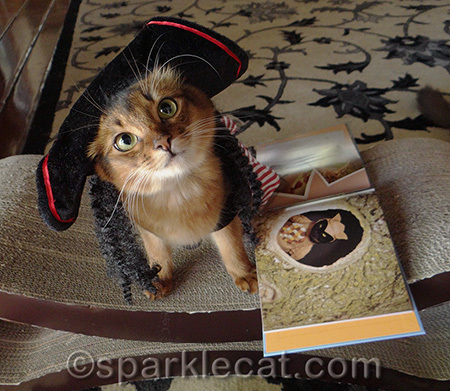 You make a purrfectly adorable feline pirate! Sparkle was not the only author in your family! I can see it now…SUMMER’S 5TH BEST SELLER! OK Mum let me post to win the book! I love your cute outfit!!! My Lexi has some dresses but she doesn’t really like to dress up. Would love to see the cute book. Summer you look very pretty in your costume. I wish my kitties liked to dress up. What a great giveaway and thanks for the opportunity. I wish my boys would dress up, even once. You look great Miss Summer Samba. What a great kitty sales-lady you are! 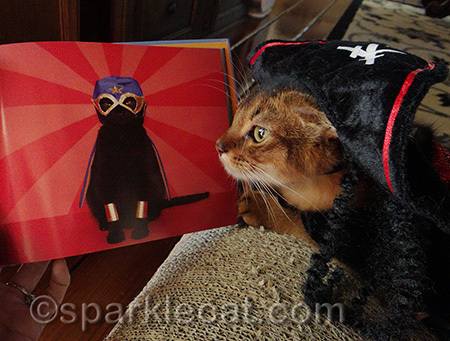 Now meowmy would like to have one of those books to see all the dress-up! Oh Summer, what a cute pirate you are and what a great giveaway! Someday you will have a book like that all about you too, Summer! Please enter us in the contest. Sparkle–I’m really impressed that you wore that outfit. My kitties would rip my eyeballs out if I tried to put a hat on them. Sigh Rafflecopter is so unfair to non-tweeters like me. But the pirate costume is fetching, dear. You are unbelievably gorgeous in your hay and ringlets, sweet Summer. How adorable! Love my kitty cat and this is precious! Summer, you’re going to be a famous book author too one day! This book does sound fabulous! Thank you for the opportunity to win one! Ya make a cute lil pirate Summer.